Let us give you a taste of what is to come in 2013. Let DJ San Fran, DJ Marty Rotman and DJ Relentless give you a true House Music Experience. 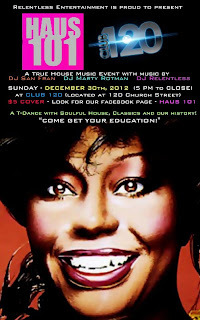 Come get your education on the past and the future of House Music. Doors open at 5:00 PM and we go until the party stops. Early enough for those who have to work the next day and can be open as late as 2:00 AM if needed. Finally, a place for the real House Headz to come together and celebrate our history. This is the music that started it all for the dance scene that is happening today. Relentless Entertainment & CLUB 120 are proud to present HAUS 101 (The House Music Movement in Toronto)!